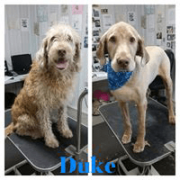 Our Pet Groomers Offer More Than Haircuts! 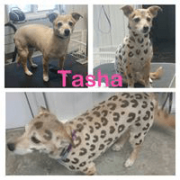 We offer pet grooming and bathing services for all breeds. We will be giving your pet a Hydro-Surge bath. They will love you for it. Hydro-Surge is a therapeutic pulsating water massage that cleanses deep into the hair coat and removes unwanted hair and dead dry skin from your pet’s coat. It will leave your pet with the cleanest skin possible. If your pet’s skin in dry, itchy or full of dandruff, we are offering a Hydrating/Exfoliating treatment which consists of a special Tea Tree and Aloe shampoo followed by a Luxury Moisturizing Conditioner to help condition your pet’s skin. If your pet is blowing their coat or just shedding a lot, try our Shedless package, consisting of shampoos and conditioners that are formulated to help break up the under coat. This package also includes an extra 15 minute brush out and the use of the high velocity dryer. 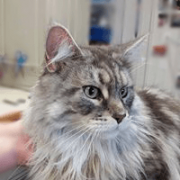 Pet nail trims are included in our grooms, but if you would like your pet’s nails to be smooth with no sharp edges, we can accomplish this by Dremeling the nails. We can even paint their toe nails! Don’t forget their Pearly Whites! We can brush your your pet’s teeth during their grooming appointment and get them started on daily dental care with an easy to use product. Make an appointment to discuss your pet’s skin care needs today! 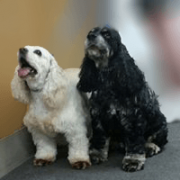 We require all vaccines be current or given a week prior to your pet grooming appointment. This protects your animal, as well as other animals and the staff. We will need your records in advance of setting up your grooming appointment. Your veterinarian can e-mail or fax them to our office so we can review them and call you back to set up your preferred appointment time.